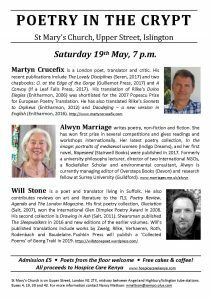 We are looking forward to another Poetry in the Crypt, taking place on Saturday 19th May in The Crypt at St Mary’s Islington at 7pm. Martyn Crucefix is a London poet, translator and critic. His recent publications include The Lovely Disciplines (Seren, 2017) and two chapbooks; O. at the Edge of the Gorge (Guillemot Press, 2017) and A Convoy (If a Leaf Falls Press, 2017). Alwyn Marriage writes poetry, fiction and non-fiction. She has won first prize in several competitions and gives readings and workshops internationally. Her latest poetry collection, In the image: portraits of mediaeval women (Indigo Dreams), and her first novel, Rapeseed (Stairwell Books) were published in 2017. Will Stone is a poet and translator living in Suffolk. He also contributes reviews on art and literature to the TLS, Poetry Review, Agenda and The London Magazine. His first poetry collection, Glaciation (Salt, 2007), won the international Glen Dimplex Poetry Award in 2008. His second collection is Drawing in Ash (Salt, 2011). Admission costs £5 on the door with all proceeds supporting Hospice Care Kenya. Poets from the floor are welcome to participate, and free cakes and coffee will be provided!